As I mentioned in my Menu Plan Monday post for the week, this is the week of squash. 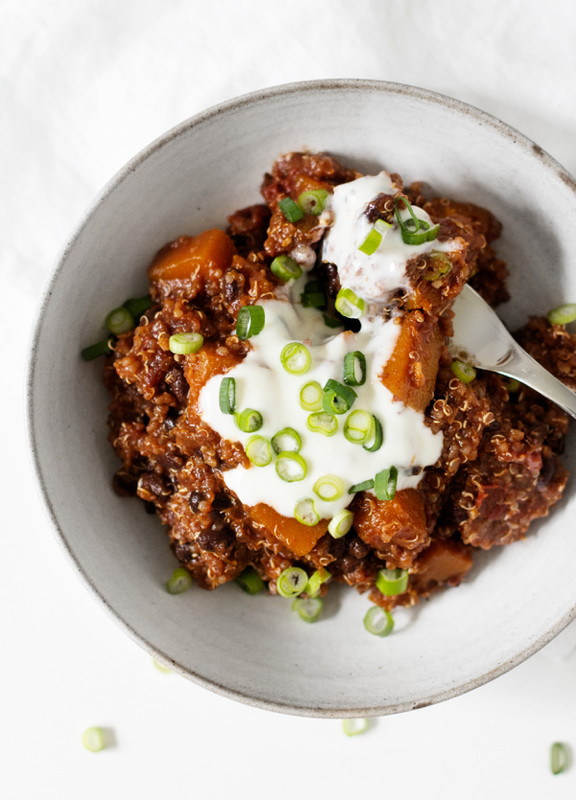 Creamy butternut squash and five spice soup earlier this week, and a really delicious, hearty, stick-to-your-ribs slow cooker black bean, butternut squash and quinoa chili today. I didn’t plan on all of the squash, but I’m certainly not complaining (I know that I’ll soon be missing winter squash as spring and summer roll around, no matter how many other vegetables there will be to savor!). This is also a week of intense schoolwork. I have my first Advanced Nutrition II exam this evening, and I’m more than a little nervous about it. It’s a difficult class, taught by a detail-oriented medical school professor, and the level of complexity reminds me quite a bit of my post-bacc chemistry and biochemistry courses. It’s hard not to feel some of the old anxiety rushing back, the fear and the sensation of helplessness I used to experience as I entered a test, totally uncertain about what to expect and whether or not I’d studied the right things. So it’s a good time for comfort food, for something warming and hearty and uplifting. 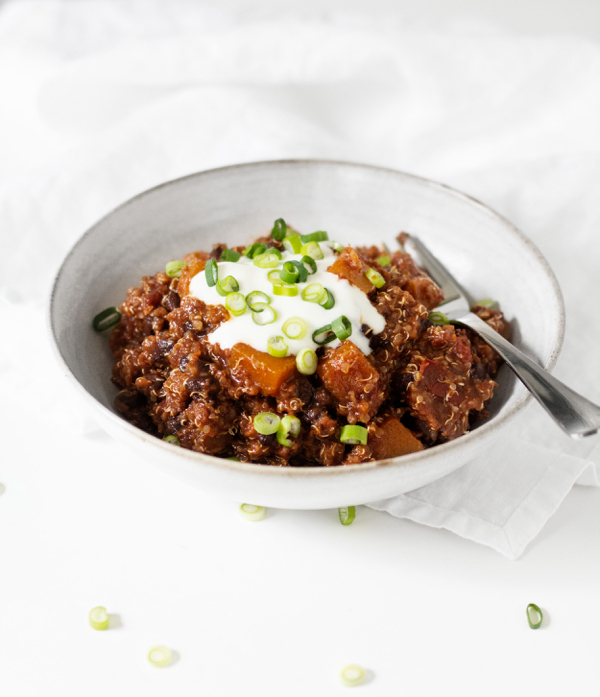 This spicy, flavorful chili is just that, and it’s also perfect exam fuel. It’s packed with satiating protein, energy-sustaining complex carbs, a healthy dose of iron, and a slew of healthful phytonutrients–I couldn’t ask for a more nutrient dense meal. Better yet, it’s a slow cooker recipe, which means that I was able to whip it up even during a week when preoccupation with schoolwork made it very tempting not to cook. If you don’t have a slow cooker, no worries: I’ve given a stovetop option, too. Like many of the recipes I’ve been making lately, this one feeds a crowd. It makes about 12 cups by my count, a generous 6-8 servings of food, depending on your appetite. You can cut the recipe in half if your slow cooker is 4 quarts or smaller, or if you make it over the stovetop. These days, though, I see so much value in batch cooking, no matter how many people one is initially cooking for. Steven and I rarely finish a huge recipe like this in a week; we love leftovers, but after three days or so we start to crave variety. Still, I always freeze what we don’t eat, often in individual portions, and I don’t know what I’d do without these freezer staples during super busy weeks. As you’ll see, there are ways to jazz this dish up a little, using chopped herbs, green onion, or a dollop of tofu sour cream, which I’ve included the recipe for. It’s really quick and easy to make, and it can work in a variety of soups or stews, or on top of a baked potato. Whether you add toppings or not, you’ll have tons of flavor to savor in this chili. Smoked paprika, chipotle peppers, chili powder, and cumin really bring it to life, and I added just a pinch of cayenne for a little extra heat. To make the tofu sour cream, simply place all ingredients in a blender or a food processor and blend till smooth. For the most flavorful chili results, heat the olive oil in a large sauté pan over medium heat. Add the onions and celery and a pinch of salt, to get the onions sweating. Sauté for about 5 minutes, or until the onions are soft and clear. Add the garlic and cook for about 1 minute, stirring frequently. Add 1/4 cup water, the tomato paste, the chipotle en adobo, the chili powder, cumin, coriander, smoked paprika, cinnamon, salt, and cayenne. Allow it to cook for one more minute, stirring to incorporate all of the ingredients. Add the broth, black beans, squash, diced tomatoes and their juices, and quinoa to your slow cooker. Add the cooked onion, garlic, and spice mixture. Stir everything to combine well. Cook on low heat for 6 hours. Before serving, give the chili a good stir and add some additional vegetable broth if you'd like it to be less thick. Taste, adjust seasonings, and serve with toppings of choice. Alternately, you can simply add all of the ingredients to the slow cooker and cook for 6 hours on low. If you have the time, browning the onions and garlic will give you most flavor. See note for stovetop option! Leftovers will keep in an airtight container in the fridge for up to five days, and can be frozen for up to 1 month. To prepare on the stovetop, follow step 1 of the instructions, using a large soup pot instead of a sauté pan as your cooking vessel. Add the broth, black beans, squash, diced tomatoes and their juices, and quinoa to the pot. 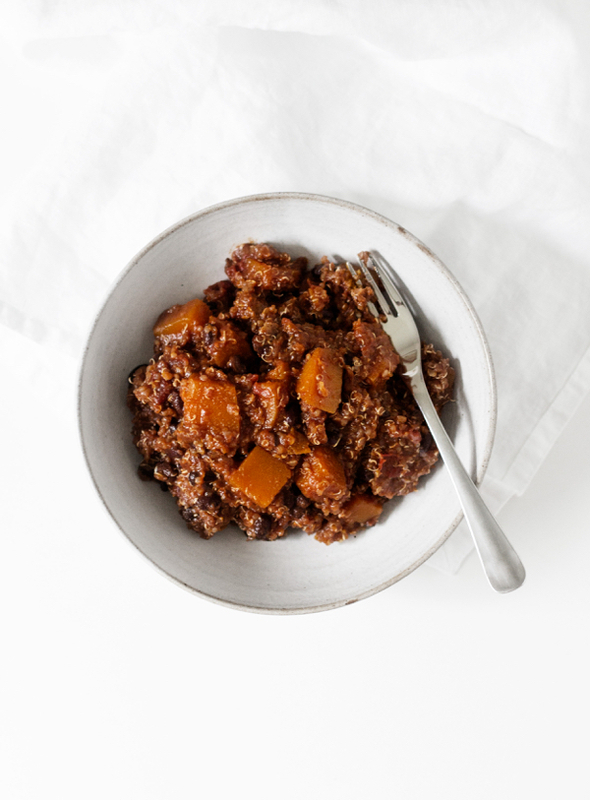 Bring the mixture to a boil, reduce to a simmer, and simmer for 35-40 minutes, or until the quinoa has cooked and all of the squash is very tender. Add some extra broth or water if the chili becomes too thick for your taste. Adjust seasonings and serve with toppings of choice. This recipe is destined to become a slow cooker go-to for me. 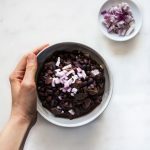 I love all of the texture, the combination of a nutty grain, tender, sweet squash, and chewy black beans. 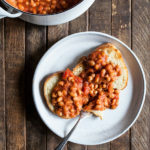 It’s such a satisfying meal, especially for cold months–and also for a day on which you’re feeling just a little anxious or vulnerable or overwhelmed. I have plenty of regrets about my post-bacc, but one thing I don’t regret is having managed to take care of my body, even when I was at my most stressed and unhappy. I didn’t relapse, and I kept myself nourished with good meals, and this kind of self-care is something I’m happy to carry into my RD education. Hope you’ll let this bowl of vegan goodness take care of you, too. Enjoy the recipe. Totally LOVING those big chunks of butternut squash. Looks so yummy! It’s so weird that I’ve never made any soup or chili in my slow cooker 😛 Hahaha! Good luck on your exam, Gena! I’m sure you’ll do well! 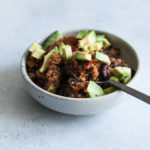 This chili looks wonderful! It looks delicious. Love me a slow cooker recipe. Good luck with the exam! I hope you’ll be adding more slow cooker recipes to the site! What size can of tomatoes please? 14.5 ounces — thanks for asking, Terri! totally yummy raw food diet treat. Looks very delicious. This recipe looks great. I think I will make it and put it over baked sweet potatoes. You mentioned that you typically freeze leftovers; do you have a certain method that works best? Should I be using glass Tupperware or freezer bags? I tend to use freezer bags. Glass tupperware has been fine every time I’ve tried it, but we have a limited supply and we usually both use them for carrying leftovers to and from class; also, it’s a lot bulkier in the fridge. But really, it’s whatever works for you! omg I´ll be making this for sure!! Looks mouth-watering <3 Thank you! Made this last evening on the stove top. I used white onions, added two minced jalapeno peppers with the garlic, and 1/4 chopped cilantro before serving. We loved it with one exception: the olive oil in the crema overpowered the lovely lime flavor. I added more silken tofu & more lime which fixed the flavor. Next time I will omit the olive oil from the crema. Thank you for the recipe. The combination is lovely. I love the recipe & just finished making it and i can say it is delicious! It has great texture and the aroma is awesome! This is the most delicious chili I’ve ever had!! I need to fill a large 6-7 qt slow cooker for a marching band dinner this week, does this fill that oval approx 6 qt size or the smaller 4 qt round size? 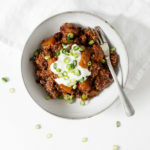 I realize this recipe is old now but I just made this chili for the first time and it is amazing. Your spices are on point! Thanks for the great recipe! I just made this today for dinner and meals during the week. Very easy recipe that turned out delicious. I sauteed the onion and celery before adding to the slow cooker as suggested and used water to cut down on unnecessary sodium. I topped my bowl with a bit of sour cream and sliced avocado. 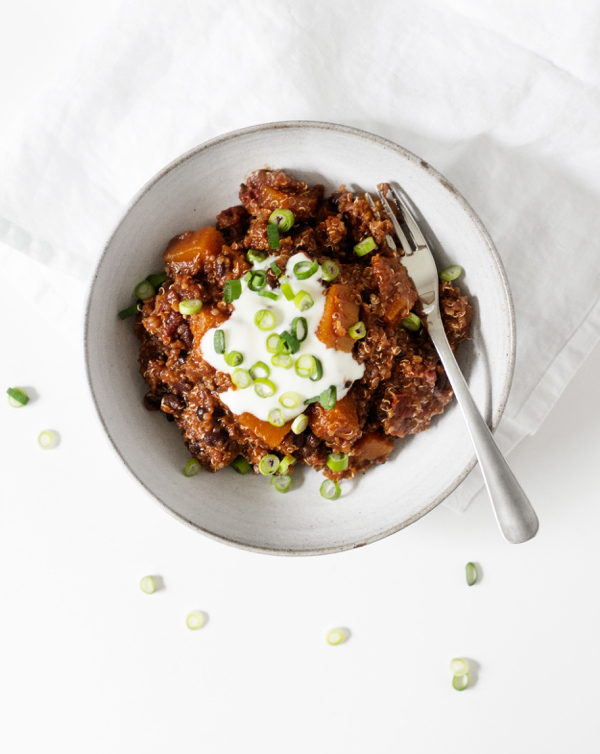 The result was a healthy, creamy, smoky, satisfying chili and I’ll be saving this recipe to use again. Thank you! Love this recipe!! Would it be possible to get the nutritional info for this please? I’m sure the numbers are good, just curious. What is your method for unfreezing the dish? Do you heat it back up on the stove top or leave it to melt over night?